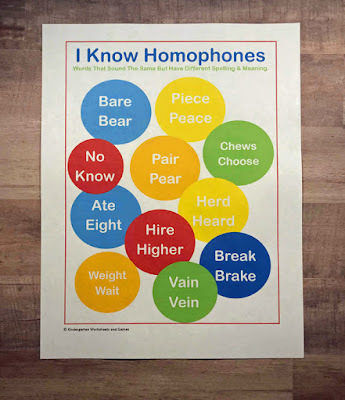 Homophones Quick Chart – We know what they are, whether we realize it or not. They are those words that often confuse emergent readers and children who are beginning to learn sight words. Homophones can be complicated for children who are beginning to write on their own and sound out words. That is why this Homophone Quick Chart & Activity are helpful for clarifying for kids. I have created a quick reference guide of a handful of examples of what homophones are. There is also a printable activity to help practice some of the more common homophones. Do you know what a homophone is? It’s a word that you may have not necessarily heard of, but when explained, I’m sure it will make sense. Homophones are words that are spoke the same but are spelled differently and have completely different meanings. Some examples of this include No & Know, Bear & Bare, and Ceiling & Sealing. Each set sounds the same but they are two completely different words. Homophones: How Can This Printable Set Help? The quick reference chart is perfect for helping children see the example words. We have only included a handful of words just for examples. These are common words that even emergent readers may know the meaning of. Seeing the words next to each other, thinking of the difference and the two definitions while seeing the different spelling can help the whole concept become clear for children. 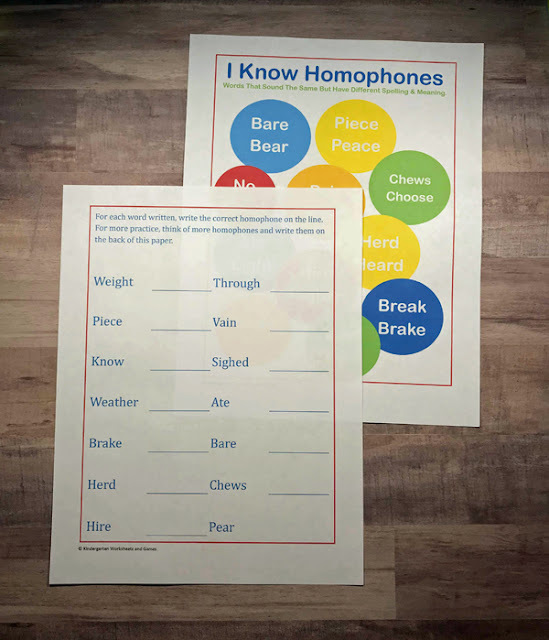 The printable activity can help children explore the homophones in a different way. 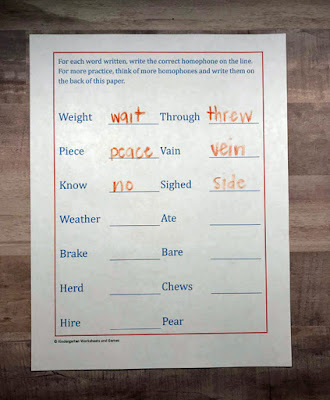 Once they understand the concept with the quick reference chart, they can connect two homophones on their own. Understanding homophones is important for children to help understand sentences and what they are reading. The wrong word can change the whole meaning of a sentence or story! Using this printable set is super easy. The first step is to print the pages. I suggest laminating at least the first page. This can hang on a wall or be used in a literacy center but would benefit from being laminated. The second page could be laminated as well, if you would like to be able to use it over and over.